Vegetable fried Rice is an Indo Chinese Recipe,Served as Lunch or Dinner. 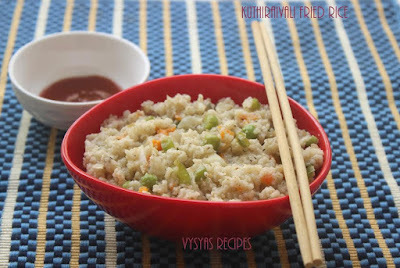 This fried rice is made with Barnyard Millet, instead you can use other millets like kodo millet or little millets also. Barnyard Millet is Cooked, stir fried in a kadai, with Vegetables of our choice & spiced with Pepper Powder. 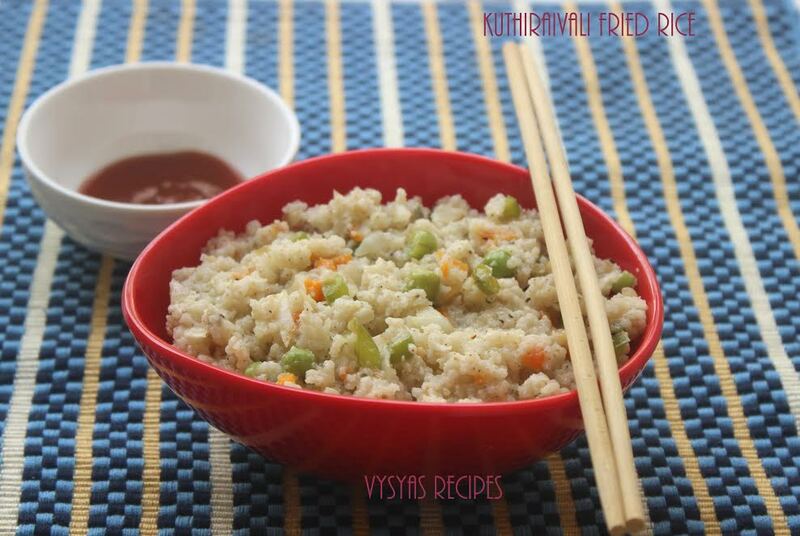 This is a Healthy fried Rice Recipe, With Millets & vegetables. Rich in fiber Content, so it helps in digestion & also it reduces type 2 diabetes.Now we will see the preparation of Barnyard Millet Fried Rice. Barnyard Millet - 1 Cup. Pepper Powder - As needed. Soak the Barnyard Millet Rice for half an hour in water. Finely chop Pearl onions, Garlic,Carrot,beans, cabbage & Capsicum. Take a wide vessel,add more water, when water starts boiling add Millets, cook in medium flame till the millets turns soft, then drain the water & spread the rice in a plate add 1 tsp of oil & allow it to cool completely. Simultaneously cook the Green Peas, till it turns soft in a kadai with needed water. Heat the oil in kadai, when oil is hot,add Cinammon & cloves.Saute till you get nice aroma. Then add Garlic,saute till it turns light Golden brown colour. Then add onions, saute till onions turns transparent. Then add finely chopped Carrot, beans & add little salt. Saute till the veggies are half cooked. Then add Chopped Cabbage & saute for 2 minutes, then add Capsicum & saute till capsicum turns little soft. Add cooked Green peas,give a mix. Add soya Sauce, & cook in high flame for 2 minutes, with continuous stirring.Then add cooked Millets, salt and Pepper.Mix well. You can add Spring Onions Green part at the last & give a quick mix, which gives nice flavour to rice. you can add paneer along with veggies. Instead of barnyard millet, you can make the rice with little millets(Saamai) also.